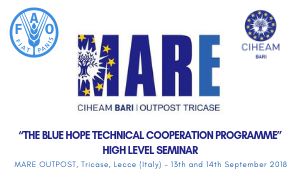 On 13 and 14 September 2018 in Tricase, Lecce (Italy), the FAO high-level seminar Blue Hope Technical Cooperation Program (TCP) will be held, in collaboration with CIHEAM Bari. The objectives of the event are to share the initial results from the FAO Blue Hope TCP—a project aimed at identifying blue growth investment programmes for communities in Turkey, Algeria and Tunisia—and for CIHEAM to solicit feedback on a proposal to develop a three-month Masters training course to empower rising leaders across Mediterranean countries with the necessary tools for the sustainable development of coastal communities. The Seminar programme is structured in two overarching sessions: a technical session and a resource mobilization session. A draft agenda is included for reference on timing. With this Save the Date we hope that you can plan to attend this meeting and contribute your technical expertise and experience or share opportunities for resource mobilization in this arena.